programs on magnetic tape, for implementing the current (prototype) offerings of internet and higher-level software algorithms. Updates will be sent automatically as required. 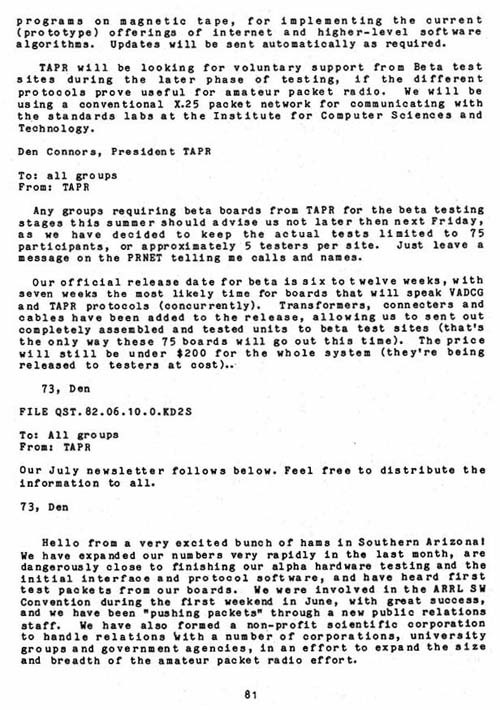 TAPR will be looking for voluntary support from Beta test sites during the later phase of testing, if the different protocols prove useful for amateur packet radio. We will be using a conventional X.25 packet network for communicating with the standards labs at the Institute for Computer Sciences and Technology. Any groups requiring beta boards from TAPR for the beta testing stages this summer should advise us not later then next Friday, as we have decided to keep the actual tests limited to 75 participants, or approximately 5 testers per site. Just leave a message on the PRNET telling me calls and names. Our official release date for beta is six to twelve weeks, with seven weeks the most likely time for boards that will speak VADCG and TAPR protocols (concurrently). Transformers, connecters and cables have been added to the release, allowing us to sent out completely assembled and tested units to beta test sites (that's the only way these 75 boards will go out this time). The price will still be under $200 for the whole system (they're being released to testers at cost)..
Our July newsletter follows below. Feel free to distribute the information to all. Hello from a very excited bunch of hams in Southern Arizona! We have expanded our numbers very rapidly in the last month, are dangerously close to finishing our alpha hardware testing and the initial interface and protocol software, and have heard first test packets from our boards. We were involved in the ARRL SW Convention during the first weekend in June, with great success, and we have been "pushing packets" through a new public relations staff. We have also formed a non-profit scientific corporation to handle relations with a number of corporations, university groups and government agencies, in an effort to expand the size and breadth of the amateur packet radio effort.